NEW YORK -- The New York Post app was hacked on April Fools' Day, sending out push alert notifications that included "Heil President Donald Trump." 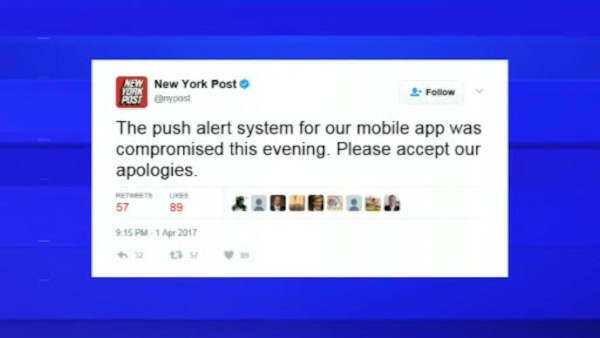 The Post apologized Saturday night, shortly after its app sent out a series of alerts. The Post said in a follow-up alert: "Our push alert notification system was compromised this evening. We are working to resolve the issue. Please accept our apologies." The messages appeared directed at Trump. One message said, "Open your heart to those you do not understand and listen to all those you fear and look down upon." The alerts even included lyrics from Nirvana's song "Come As You Are": "Take your time, hurry up, the choice is yours, but dont be late..."
The Post is owned by Trump-friendly media mogul Rupert Murdoch.